The maritime law firm was awarded the 2019 Best Law Firm national ranking for its fourth consecutive year. Lipcon, Margulies, Alsina & Winkleman, P.A is excited to announce its selection and national ranking as a “Best Law Firm” by US News & World report for its fourth year in a row. In naming a Best Law Firm for a particular category, U.S. News and World Report sends out evaluation forms to millions of attorneys and clients. These evaluation forms give peers and customers an opportunity to praise or criticize various aspects of the firm, from expertise to communicativeness to costs, and more. 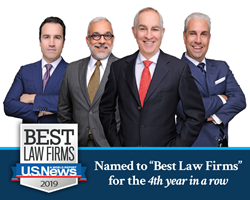 The award came in conjunction with the August selection of four of Lipcon’s attorneys (Charles Lipcon, Jason Margulies, Ricardo Alsina, and Michael Winkleman) to the 2019 Best Lawyers List. Best Lawyers is an independent publication with a similar evaluation form system, though the attorney must first be nominated by their peers before they are evaluated. LMAW, P.A. is the only plaintiffs’ cruise law firm that is nationally-ranked in admiralty and maritime law, with four attorneys also named to Best Lawyers. About Lipcon, Margulies, Alsina & Winkleman, P.A. For over 40 years, LMAW, P.A. has been a dedicated maritime law firm that provides legal assistance to those who have been harmed or victimized in a cruise-related incident. The firm is nationally and internationally recognized for its commitment to bring justice to passengers and crew members.